Providing one-on-one tutoring for children in grades 1 through 5, the Study Buddy Program meets twice a week after school at Bannaker Elementary. The adult tutors, or “Study Buddies,” help the children with homework assignments in areas such as reading fluency, phonics, math, and other core subjects. While the academic support is important, the children in our Study Buddy Program develop friendships with their tutors that can last a lifetime. 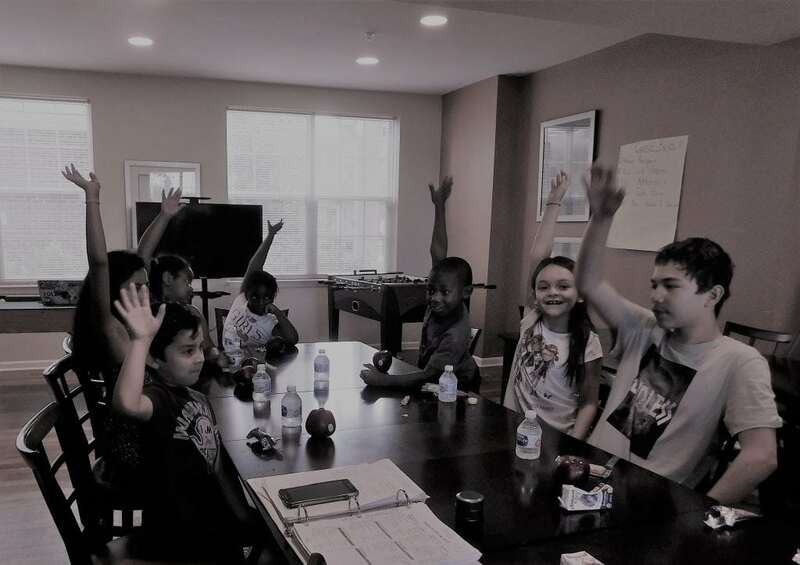 On non-tutoring days, we supervise after-school activities for children at the Community Room at Llewellyn Village Apartments. Two 3-hour sessions are held every week. Activities include homework completion, independent and group reading, educational board games, arts and crafts, and supervised computer use. The emphasis of this program is to provide a safe place for children to socialize after school. For our older children, we offer “Teen Time” and “Networks” in the computer lab. They receive homework help, mentoring, and college counseling. Windy Hill runs a drop-in camp at the Middleburg Community Center for preschool and elementary school children everyday throughout the summer months. The children participate in a wide variety of activities that incorporate enjoyable learning experiences and imaginative creative projects. These include field trips to cultural sites in the area. Some of the children even return to the program as Camp Counselors! Most Windy Hill residents don’t have any dental insurance. To get our children on the path to solid dental health, our Healthy-Child Program offers initial dental screenings and subsequent dental work to residents under 18. Local dentists volunteer generously to make this program possible. Our goal is to have 100% of Windy Hill children participate in this program. To help deserving high school students pursue higher education after they graduate, Windy Hill has established a scholarship fund. We want every student to dream big, so we do everything we can to ensure that those dreams can come true. Windy Hill supports our seniors’ efforts to age in place with social activities. We provide personal enrichment activities like gardening, on-site arts and crafts, walking club, movie nights, Bingo, and Wii games. Every other Friday, the “Friday’s Feast” provides home-cooked meals to our seniors with the help of over 40 local volunteers. We also provide much needed transportation services for amenities and social needs. We also offer monthly health screenings so that our seniors can have their blood pressure, vision, and hearing checked. To help residents obtain access to the many resources that the D.C. Metropolitan area has to offer, Windy Hill has two 14-passenger mini-buses. This much needed transportation assists our residents in obtaining medical care, as well as taking the children to the camps and field trips. We offer a Computer Lab with connectivity so our residents can access important information on-line including school reports, health needs and access to other needed resources. When something unexpected happens, families can experience sudden financial hardship. The Windy Hill Foundation’s Family Development Committee maintains a fund to provide assistance with rent, utility bills, and childcare to residents who experience family or medical emergencies. Coming in the Fall of 2018, Windy Hill will be partnering with BB&T Bank to provide financial literacy education to our young adult community to help better prepare them for their financial future.